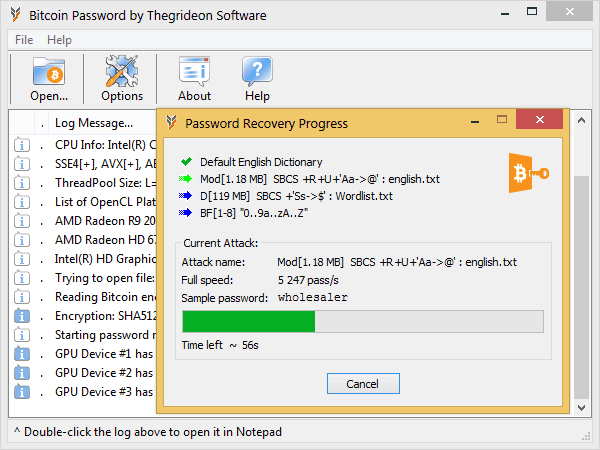 Bitcoin Password by Thegrideon Software is a feature-rich password recovery tool for bitcoin and similar wallets (based on "wallet.dat" database files): Bitcoin, Litecoin, Baha, DASH, ... There are hundreds of cryptocurrency clients, forks and versions, thus the best way to check compatibility is to open your wallet (or a test wallet with known password) in trial version. You may also check Password Search FAQ. simple modifications: add part(s) copy, add reversed copy, etc. preset or custom char replacements: Ss with $, Ii with !, Aa with 4, etc. The length limit of a password is 40 (special Unicode) to 120 (plain ANSI) chars. 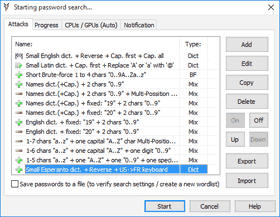 "Save passwords to a file" option to verify search settings, generate new wordlist, etc. Audio, script or web address based post-search notification. Highly optimized code (SSE, AVX, AVX2, AVX-512) guarantees best performance. Utilizes integrated GPUs as well. 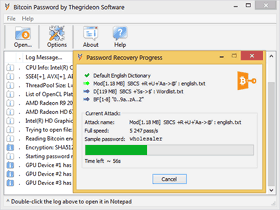 Bitcoin and related cryptocurrency Wallets password protection is based on SHA-512 and AES-256 algorithms with thousands of iterations, thus recovery speed is limited, but we did our best to enhance this tool performance (recovery speed) with some advanced methods and a good CPU / GPU hardware is required to achieve fast recovery speed.Bitcoin Password allows you to setup a very precise search range to exploit known password details (parts and patterns) and to cut the required time of a search comparing to traditional attacks. Just check mixed attacks for example. Wallet encryption parameters are selected based on computer power available during the encryption process, thus recovery speed (complexity) is variable from Wallet to Wallet. The following tables are based on a Wallet with 75000 SHA-512 iterations. The final password recovery speed is equal to CPUspeed + GPU(1)speed + ... + GPU(N)speed. For example: Intel i3 + integrated HD 4400 GPU + AMD R9 270 = 185 + 70 + 3 200 = ~3 400 p/s. Modern integrated GPUs (like Intel HD and Iris Graphics) can be used for password recovery acceleration. Integrated GPUs are not as powerful as dedicated (discrete) devices and often overlooked but can add up to 30% to CPU performance. Compute units or stream multiprocessors (CU, SM, SMX, SMM) are the main building blocks of GPU calculation power, thus 32xCU GPU card is almost 2 times faster than 16xCU GPU card of the same family and architecture running on the same frequency. For cards with compute capability sm_35 (Kepler 2.0) and above (Maxwell, Pascal, Volta, Turing) you can expect approximately 250-300 p/s per every SM running at 1000Mhz. Test results below are shown to be very close to this estimation. AMD GPUs are very "password recovery friendly" and consistent with architecture change from VLIW5 to VLIW4 and now to GCN. You can expect approximately 150 p/s per every CU running at 1000Mhz. It is important to mention that AMD and NVIDIA architectures are quite different and although AMD per CU performance is lower, there are more CUs per card in a similar price range. Moreover GPU performance is somewhat variable with number of factors including GPU/CPU combination and even a driver version. Please contact us if your recovery speed is noticeable different from the data above. Trial version can be used to check format and hardware compatibility. 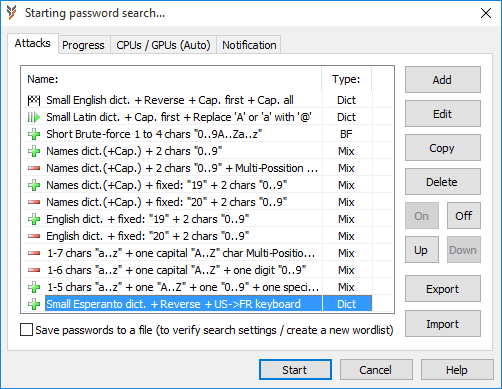 It allows you to setup and test run any password search for up to 15 min per run. Recovered passwords are hidden behind the asterisks.